It should come as no surprise that bestselling author Kevin J. Anderson is writing humorous urban fantasy. And why not, he has done everything else. Ok, maybe not everything else, but it can seem that way when you consider his hyper-productive output of one hundred and twenty-five books in twenty-five years. He’s even written a book on productivity. Starting with Death Warmed Over in 2012, Mr. Anderson has written four novels and several short stories in his humorous Dan Shamble, Zombie PI series. Working Stiff collects all the shorter works featuring this undead sleuth. Dan Chambeaux, aka Dan Shamble, is a private investigator in the Unnatural Quarter, a section of New Orleans popular with undead and mythical creatures ever since an event called the Big Uneasy unleashed them on the world. Dan himself joined the ranks of the undead after being shot while investigating the death of his girlfriend (now a poltergeist assisting with his cases). He clawed his way out of the grave and went straight back to work with the dogged persistence of a zombie. His partner at Chambeaux & Deyer Investigations is an attorney, an African-American woman determined to make sure monsters get a fair shake in the legal system. The team often works in conjunction with Dan’s friend, Toby McGoohan, a beat cop relegated to the Unnatural Quarter due to his propensity for off-color jokes and torturous puns. Despite noir elements, the overall mood of these stories is fairly light due to the humor employed by the author. Through skillful worldbuilding, Mr. Anderson frequently shows the reader the kind of comical incongruities that surface when monsters are inserted into a world exactly like our own. And by having an attorney as Dan’s partner, we get to explore the legal implications of such a world. For instance, what happens to “till death do you part” when death doesn’t actually lead to parting? The reader is also frequently exposed to a variety of wordplay including comical descriptions, playful cultural references, and of course the time honored SF/F tradition of puns. The end result is light and playful fun laced with dark humor. “Stakeout at the Vampire Circus” – Chambeaux & Deyer is hired to find out who stole a fortune teller’s magic deck of cards. Dan questions colorful circus performers including a death-defying (or whatever the undead defy) vampire trapeze artist who performs without a net above one hundred sharpened wooden stakes and a clown that elicits more screams than laughs. Perhaps the weakest story in the collection. The plot didn’t grab me and the humor wasn’t quite up to the level of the other stories. 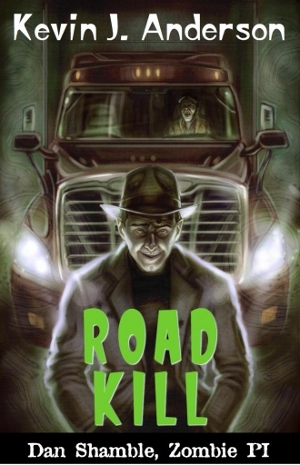 “Road Kill” – Dan wakes up in a coffin that’s been nailed shut, but he can’t recall how he might have gotten into this situation. Gradually he remembers that Officer McGoohan has enlisted his help in the witness protection program. Funny, tight and engaging. “Naughty & Nice” – It turns out that Santa Claus is an unnatural, and he’s come to the offices of Chambeaux & Deyer desperate to get back the stolen Naughty & Nice list in time to save Christmas. Not only that, but an elf named Elfis (yes, rhinestone-studded jacket, blue suede shoes and all that) is looking to cut in on Santa’s business. Meanwhile, McGoohan reports that children are going missing. This story is jam-packed with Christmas and Elvis related humor, some of it almost criminal – but oh so funny. For a more extensive review of this story, see Ricky Brown’s review posted here at Amazing Stories in December 2013. “Locked Room” – A harpy with a nasty disposition hires Dan to verify that a tomb she’s had built for her sister is entirely escape proof. The shortest story in the collection is limited in plot, but entertaining never-the-less. “The Writing on the Wall” – Officer McGoohan is dealing with a rash of incomprehensible graffiti by young zombies. Meanwhile Chambeaux & Deyer has been hired by a fan to obtain the signature of Angina, Mistress of Fright, an Elvira-like movie hostess turned recluse after retirement. On the campy side, which is actually fitting considering the subject. “Role Model” – McGoohan asks Dan to help him provide extra security for a cosplay convention at the Motel Six Feet Under and Conference Center. It seems like an easy job until a Stormtrooper gets impaled with a wooden stake and the prime suspect is a Klingon. It starts slow, primarily because Mr. Anderson spends a little too much time describing the attendees, but once the story gets going it makes for a good mystery. 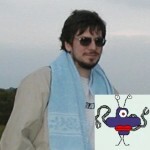 Fans will find much to laugh at, but if your fan knowledge is rather limited, you will miss many of the jokes. “Beware of Dog” – A snarling whirlwind, not unlike the Looney Tunes Tasmanian Devil, trashes a saloon in the Unnatural Quarter and McGoohan enlists Dan Shamble’s help in figuring out what happened. The next morning, Hairy Harry, a retired cop (Clint Eastwood’s Dirty Harry in werewolf form), hires Dan to find his missing pet hellhound. The Eastwood character is spot on and the little GETA (PETA) gremlins are fun. While I can’t vouch for the other books in this series because I haven’t read them, I can say that I enjoyed this collection, and that is saying something because I don’t care much for urban fantasy and even less for zombie fiction. But humor is, in a sense, its own genre, and as humor, these short stories succeed. 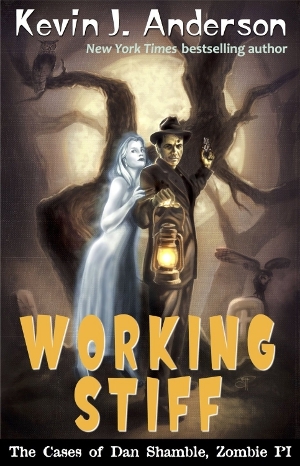 Working Stiff is a playful blend of light and dark comedy that should satisfy both humor and urban fantasy fans alike. Working Stiff is available from WordFire Press. 3 thoughts on "Scide Splitters: Working Stiff by Kevin J. Anderson"
David, you may be right about the way I misremembered the story title and the connection with KAJ. On your advise I’ve purchase all 3 volumes of UFOs for Kindle. Although, I’ve only just start Volume 1. Another similar character that surfaced in my remembering was Steve Niles’ P.I. in his “Criminal Macabre” series from Dark Horse. Looking forward to you next posting. Another enjoyable review. In the past, I may have read one of the short stories and knew that KJA had done others. Although the ones you name and describe don’t sound familiar. Thank you for the lead. Thanks, John. As far as I know, this collection has all the shorts from the series up to this point, but then I very well could be wrong. It’s also possible that you are thinking of one of KJA’s other humorous urban fantasy stories not related to the series. For instance, “The Fate Worse Than Death” which I reviewed in the UFO3 anthology involves a fan breaking into a vampire’s house. If you happen to remember the name of the other story, I’d appreciate the correction.